A breathtaking fantasy romance, the first in a sensational new series by USA Today Bestselling author Karen Tomlinson. The war raging in the South seems a remote danger for seventeen-year-old Diamond Gillon until her home is brutally attacked. Catapulted into a terrifying new world where legendary beasts arise, magic is condemned, and half-blood fae like her have no rights, Diamond is inexplicably drawn to her saviour. But Commander Hugo Casimir is a ruthless elite guard owned by a cruel, immortal fae queen who will murder her own people for magic. As she sinks deeper into Hugo’s world, Diamond’s circumstances become ever more dangerous, for the Queen covets more than just her magic. To discover who she truly is, Diamond must escape the Queen’s clutches—before her fate, and that of The Eight Kingdoms, is sealed in shadow and chaos. 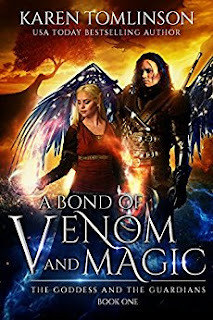 A Bond of Venom and Magic is an epic fantasy tale, ideal for mature Young Adult readers. Fans of Sarah J Maas and Leigh Bardugo will love to discover this spectacular new world steeped in dragons, romance, and armoured winged warriors. Welcome to the world of the Fae . With a war brewing in the south Diamond has been left unaffected until the day she is attacked at her little school house . Her life is turned upside down. She heads to a world where the legendary beasts arise and magic is not what you want to have . Being a half fae she is basically at the bottom of the barrel according to the world of the Fae . When Hugo comes into her life , she is drawn to the cruel guard . Will they survive the evil queen who wants Diamond for her power and will they realize that they are more to each other . This is such a good fantasy novel , the characters are well written. Diamond is an outcast but she is also a strong girl that when push comes to shove she will fight for those she loves and needs . She grows up a lot through out the book . I can't wait to see where the author takes her . Hugo well this poor man is well basically between a rock and hard space . He wants to protect Diamond from the evil queen but he is torn because he works for the queen and she wants Diamond . You really see Hugo go through so many emotions when he is with Diamond from love to ultimate protection . They are a couple that will grow hopefully together . This is an epic ya fantasy , you are transported to a time and place of magic . You have the good versus evil , heartbroken heroine and an epic mystery that needs to be solved . I couldn't put it down . The characters are lovable and the story is good . I will say that there are a few things that did bother me like the repetition of the some of the emotions both the main characters had . It just seemed flat and yes I admit I skimmed those parts . Over all I really enjoyed this book and fell for the characters . This would be a great book for teens who want an epic read for this summer . Even us adults that love getting lost in a great fantasy .